Westerbeke fuel-injected gasoline generators slash deadly carbon monoxide emissions! Westerbeke's low-CO gasoline generator emissions make boating safer for you, your loved ones and your guests. It's better for our environment, too! Westerbeke's innovative engineering and electronic fuel injection make this possible. Low-CO generators are just as affordable, compact, lightweight, quiet, and reliable as their predecessors. At Westerbeke, we've made it our priority to improve boating safety. Shouldn't you? Engines produce Carbon Monoxide (CO), a colorless, odorless, tasteless... and lethal gas. Government and environmental groups have set different limits for exposure but all agree that 1200 ppm is "immediately hazardous to life and health." 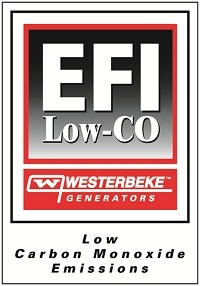 Until Westerbeke developed low-CO gensets, marine generator exhaust contained far higher concentrations. Lab testing of our latest generators shows CO emissions are dramatically reduced compared to our conventional marine gasoline gensets.